I'm going to make an admission: I have no idea what "plot" means. It confuses me. Some movies are supposedly tightly plotted, others are supposedly plot-less. Personally, I find "plot" to be totally useless when trying to figure out how to tell a story. Instead, I prefer to focus on what every story has in common. Every story, whether action, comedy, slice-of-life, or abstract will build tension and then release that tension at a certain point. That's it. That's all you need to know about telling a story. So how do you build tension? Start with a small event, followed by a bigger event, and finish with a really big event. Kung Fu Hustle is a great example of a very simple version of this structure. It's nothing more than a series of fights and comic moments that get progressively bigger and more absurd as time progresses, until the final moment culminates with a decisive end of the escalation. Don't worry about inciting incidents, don't worry about story beats, just start with a small event and follow it up with bigger events until you come to an event that finishes it all. This even works scene to scene too. Every little part of your story should follow the same pattern, as long as the resolutions to the little stories build toward the overall big story. This even works for stories that are slow, minimalistic or sparse. It just happens much more subtly, and the climaxes are smaller (although not necessarily less powerful). Case in point is Ozu's Late Spring . While the events are quotidian, they build toward a powerful tension that is released with the final subtle moments of the film. Paul Schrader's Transcendental Style In Film is an in-depth description of how this works with "quieter" stories. While he refers to "codas" and "human density" he's basically just describing the same process; build tension and then, release it. Even a movie like Baraka , that isn't even really a story, follows the same pattern. It's a series of seemingly unrelated, but beautiful images from around that world that tie together thematically as the film progresses. The culmination is a collection of disturbing images of genocide and violence, interspersed with dark Japanese performance art, followed by a visual harmony that suggests a unification of all the images that have come before. While its quality is more musical than narrative, it still builds and releases. The fun thing about telling stories is that there are a ton of ways that you can accomplish this, but you don't need to over-think it! 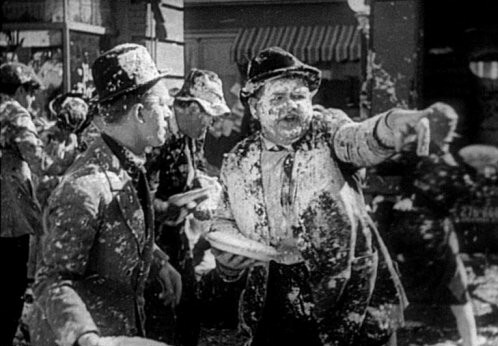 Just make sure the big pie fight is at the end of the movie and not at the beginning and you're on your way. Now, having said all this, I think there are some details about how to best do this, but they aren't hard fast rules, and I can think of exceptions to almost every other element that I think makes a story good. Many of my favorite stories have dynamic characters, interesting turns and compelling stakes, but I have other favorites that do fine without. But every story, somehow, has to build to something.